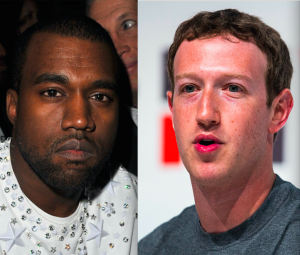 Kanye West is begging Facebook billionaire Mark Zuckerberg for help, one day after acknowledging that he has “53 million dollars in personal debt.” But that’s not all. In yet another Twitter rant, West says he’s also desperately “down” for assistance from Google founder Larry Page. After that, West shifted into high gear about needing help. “Mark Zuckerberg I know it’s your bday but can you please call me by 2mrw,” he began. The rapper then tweeted, “World, please tweet, FaceTime, Facebook, instagram, whatever you gotta do to get Mark to support me.” After then calling himself “this generation’s Disney,” West expressed that he doesn’t have “enough resources to create what I really can,” which is why he was reaching out to the Facebook founder on Twitter (huh?) and begging, “Mark, I am publicly asking you for help.” “One of the coolest things you could ever do is to help me in my time of need and I will always respect you for that and the world will love you,” West further beseeched Zuckerberg.